Quintessentially British design and exquisite craftsmanship combine with the vintage-inspired Emmy London collection. 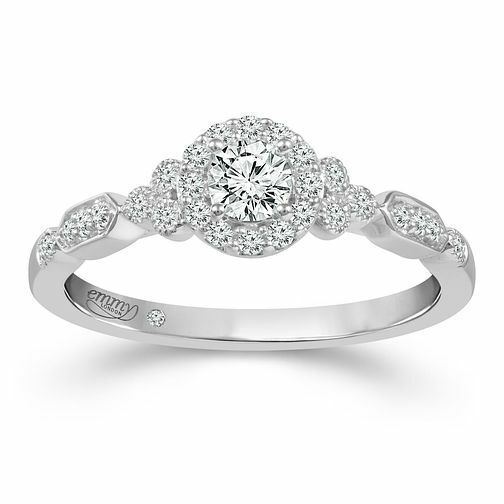 This captivating ring is poised from platinum, showcasing a dazzling display of diamonds in seamless style. A sparkling brilliant-cut centerpiece is accentuated with a beautiful shimmering surrounding halo and shoulders. A secret stone is set upon the inside of the band, beside the Emmy London signature. An exquisite and elegant ring to express your feelings towards a special someone. The total diamond weight for this ring is 0.33ct.